Judge Coss graduated from Hillsboro High School in 1969. He graduated with a B.A. in History from The Ohio State University in 1973 and received his Juris Doctor Degree from the Ohio State University in 1975. He was admitted to the Ohio Bar on April 30, 1976 and was elected to the first of six consecutive terms as Highland County Prosecuting Attorney in November of 1976. During his career as Prosecuting Attorney he served as President of the Ohio Prosecuting Attorneys Association and served four years as a member of the Board of Trustees of the National District Attorneys Association. He maintained a private law practice from 1976 in Hillsboro until his appointment to the bench on August 25, 2008. His practice included civil litigation, corporate law, personal injury, domestic relations, real estate and probate. 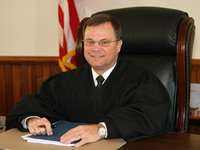 Judge Coss was elected to a six year term in November of 2008 and re-eelected in 2014. He presides over both the General and Domestic Relations Divisions of the Court.